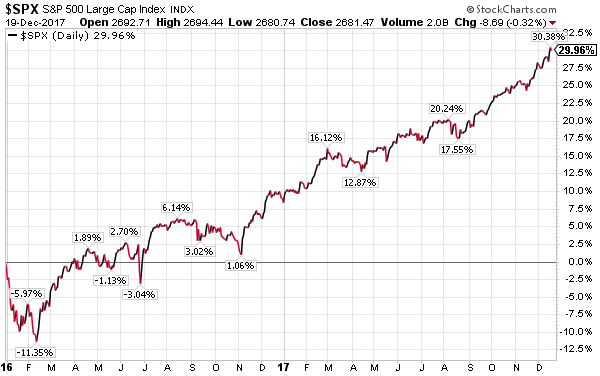 Much has been written about the stock market's advance since the end of the financial crisis in 2009. Without getting into the valuation issues, as I have written about that for maybe too many times, the recent return, nearly past two years, has been pretty remarkable and has occurred with a very low level of volatility. Business and consumer optimism is high, institutional investor optimism is high and individual investor optimism is rising. Almost seems as good as it can get from a sentiment perspective. We know corporations are sitting on a lot of cash with large amounts trapped overseas. The tax bill working its way through Congress is addressing this issue via a change on the taxation of cash held outside the U.S. 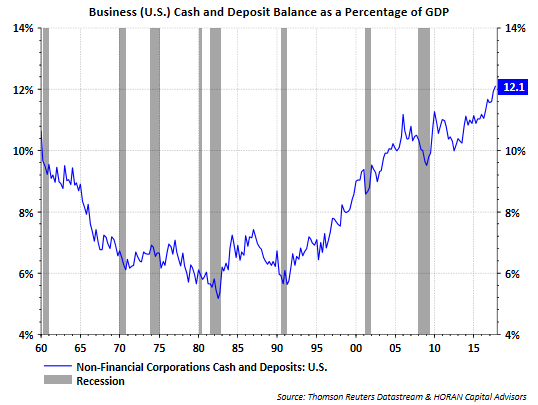 This increase in corporate cash seems to be an issue that has developed over many years as can be seen in the two charts below. 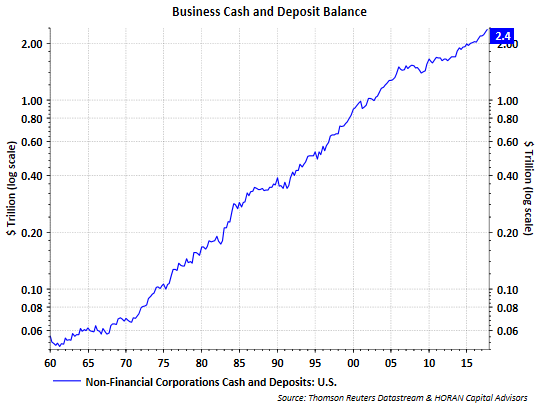 The first chart notes the absolute dollar amount of the cash while the second chart shows corporate cash as a percentage of GDP. "In 2003, a combined $30.3 billion in special dividends was paid to shareholders of S&P 500 constituents this figure jumped to $179.4 billion in 2004, an increase of 492%. In 2005, aggregate special dividends fell to $49.2 billion. Of this $179.4 billion, a collective $149.8 billion (84%) came solely from companies in the GICS Information Technology sector. Notable companies such as Microsoft (MSFT-US) and Motorola (MSI-US) contributed the most to this total. Financials and Healthcare were also top contributors." And finally, at the end of the day, there will likely be demand for stocks outside of just corporate buybacks. As the below chart shows, both in absolute terms and as a percentage of GDP, household deposits are far above pre-financial crisis levels. 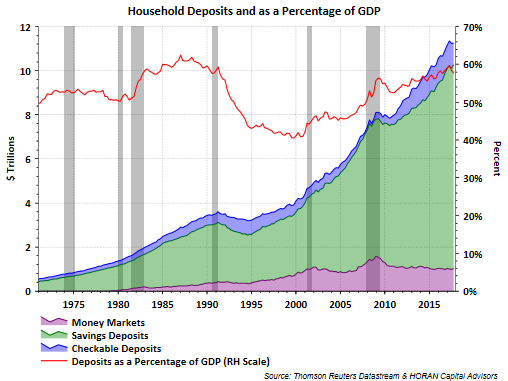 As a percentage, deposits are nearly 60% of GDP. If cash is king, individual investors are sitting on potential fuel for the next move higher in equities.